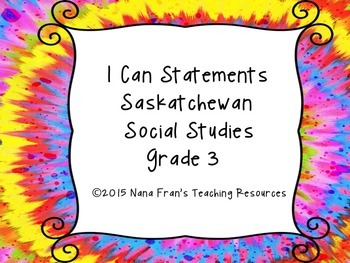 These I Can Statements are based on the outcomes and Indicators outlined by the Saskatchewan Ministry of Education for the Grade 3 Social Studies Curriculum. Teachers can print them off and laminate them to use as bulletin board headings or to post in the classroom so that students are aware of the purpose of the discussions they have and the activities they complete. In addition, there is a file in this bundle that contains all the outcomes and indicators in table format with three columns. Teachers can use this file as a checklist to let them know when they taught an indicator and to make reference notes regarding the lesson.